Data released from Ysgol Maes Y Coed, a special educational needs school in South Wales, UK showed a staggering reduction in problematic behaviors in case studies of children ages 7-14. Researchers tracked baseline behaviors for one week without TouchPoints, stress-relieving neuroscience wearables, and one week with the devices on the children during the entire school day. The diagnoses of the children included Autism and Global Developmental Delay. Different problematic behaviors were tracked per the individual child. In one child, lying on the floor and screaming occurred 27 times and 67 times without the devices. That reduced to 6 times and one time, respectively over the course of the week with the TouchPoints. In another child, the number of incidences of head banging was observed 273 times without the devices and 18 times with the devices. Ali Rodenburg BA(Ed)Hons, MDip, the principal researcher, commented that introducing TouchPoints to the school yielded “an extremely positive impact on pupils who have limited ability to explain how they are feeling and communicate their frustrations.” Every child who used TouchPoints “has displayed a reduction in their visible anxiety/frustration.” Overall, there was an average reduction of 72% of problematic behaviors. “This is outstanding and has huge potential,” she added. “The impact on wellbeing and maintenance on inner calm is overwhelming.” The school plans on continuing to use TouchPoints with more of their students. Entrepreneur Vicki Mayo and Neuropsychologist Dr. Amy Serin founded TouchPoint Solution in December 2015 to create TouchPoints, the first wearables that reduce stress non-invasively and in real-time without the need to stop what you are doing. Published research using TouchPoints shows a reduction in 70% of stress in as few as 30 seconds of use. 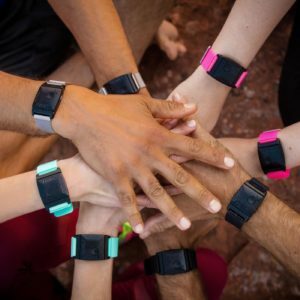 TouchPoints offer a new era of tech wearables that may divert the body’s stress response to improve calm, performance, help with anger management, and even earlier onset of sleep.